Imagine feeling the force. Imagine making your friends think you have powers. Introducing the educational but really cool Star Wars "Force" Glove! So what is this "Force Glove"? It's one of the latest brain child's of Uncle Milton's Line of Star Wars science products. These are built to teach kids about science with the fun and fantastic world of Star Wars as a backdrop to really get them interested. If you have kids just think about how cool this would be to a young mind (that's not yet been told anything is impossible!). Science is fun when it uses props like this. It's right up there with the awe of dry ice as a kid. 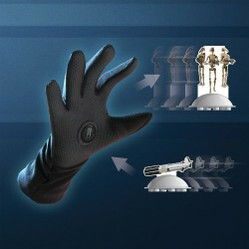 The Force Glove sounds magically Jedi and in a way it is. Jedi's use an invisible force as it's guide and to make things happen, there is a lot of technology helping them with this, so the force glove is like that technology a kid could love and use. Are you a Star Wars enthusiast? Do you just like science and great toys that do seemingly magical things? Did you get your hands on one of the biofeedback toys that came out a few years back and a few that came out last year (like the Jedi Trainer)? If not your missing out on some really amazing technologies coming out. You can, for example, tap into the force of magnets with a science toy that teaches while having a great deal of fun. As a kid watching the original Star Wars saga, I remember wanting to move objects with my mind. I even tried to do it, thinking that tensing up my arm and concentrating on an object would render it to move with the sheer power of my will. It didn't, of course, but with 'the force glove, it could have! Buried in the palm of the glove is a powerful magnet. It's embossed on one side with an imperial crest, the other side is adorned with the Rebel Alliance logo. The glove comes with two target magnets and a magnetic base. The targets are droids with one carrying a light saber (armed). The gloves magnet either pulls or pushes the target based on how the glove is positioned. The magnets have a strong pull and repel force to them at a minimum proximity to one another. By using some slick wrist twisting gestures you can create some cool movements of the remote targets!